I'm Peter Rukavina and this is the story of a project called OpenCorporations. On November 7, 2008 I read a news story from the CBC about a proposal by a developer called Homburg International to build a tunnel under the street two blocks from my house in downtown Charlottetown, Prince Edward Island. The tunnel was designed to connect the Confederation Court Mall with the Confederation Centre of the Arts. Because I'm concerned about my neighbourhood I'm also concerned about the identity and motivations of those that would seek to develop it, and so I set out to find out more about this company. I turned to the online Corporate Register for Prince Edward Island, an official government resource that provides information about corporations, their shareholders and directors. The only results there, however, were registrations for five "extra-provincial companies," none of which was called "Homburg International." On November 19, 2008 at 5:39 p.m. I set the search spider (source code) loose and over the next several hours it gathered data on 6,591 corporations, 1,178 trade names and 16,222 shareholders and directors. My plan at this point was to run the spider on a fortnightly basis to ensure the data was up-to-date. There was no new information in OpenCorporations — anything found there I could, eventually, find in the Corporate Register, albeit after a lot of laborious searching — it was just a wrapper around corporations data that made searching easier, and establishing connections between corporations possible. My OpenCorporations tool allowed me to answer my Homburg question: an OpenCorporations search for "Homburg" showed me three shareholders. This led me to figure out that a Nova Scotia company called Homburg LP Management Incorporated is a shareholder in a PEI company Hardegane Investments that, in turn, is the sole shareholder in Dyne Holdings. Dyne Holding owns the Confederation Court Mall. Reasoning that if OpenCorporations and its novel search features were useful to me they would be useful to other people — citizens, journalists, even the corporations it indexed — I decided to hone the tool a little and make it available to the general public. Before deciding to do this I grappled with the privacy and access questions that such a "mashup" would have: while the data I indexed was indeed public data, I was concious of the fact that I was introducing, in effect, a new sort of information by allow a new kind of search. While it was clear that Freedom of Information and Protection of Privacy legislation wouldn't apply to my actions, as I'm not a "public body," I still wanted to be comfortable with the implications of the tool in this regard. I ultimately decided that, because a corporation is an artificial entity that we the people allow to be constructed, an entity, as well-outlined in the movie The Corporation, that is tantamount to a "person," we the people have a responsibility to be vigilant about not only who controls individual corporations, but also about the complex web of inter-corporate relationships that have always been largely hidden from view. OpenCorporations was a tool that enabled that responsibility to be carried out. 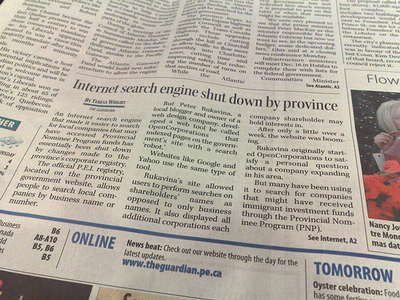 And so on November 27, 2008 I announced OpenCorporations to the world, and people — most of them on Prince Edward Island, as it turned out — started to use it: over the first 24 hours there were 17,046 searches conducted. I pointed this change out to several of the journalists who had expressed interest in the project, suggesting that while I didn't know the reason for the outage, I hoped it wasn't related to OpenCorporations. Before the reason could be found, however, the search came back online later the same day. Over the following week OpenCorporations continued to be well-used, serving just over 150,000 searches. Sometime toward the end of the week, however, Government modified its Corporate Register, inserting a CAPTCHA between the search results and the corporation details. They termed this a "security feature." The practical effect of this change, beyond making use of the Government's tool more cumbersome for people, was to cut off the ability of search engines to index the corporations details. This not only affected OpenCorporations, but any search engine — Google, Yahoo, and so on. I received a note about the change from a reporter on Sunday, December 7 and after reviewing the new configuration and its intent I realized that it was going to effectively prevent me from "spidering" updated information from the Corporate Register, and the data in OpenCorporations.org was going to quickly fall out of date. And so, just 10 days after releasing the site to the public, I announced that I was going to have to shutter it. This announcement created a sudden flood of media interest in the project: on Monday, December 8 I took calls from reporters at The Globe and Mail, The Guardian, and local CBC Radio and Television. That afternoon reporter Angela MacIvor, from the CBC Television supper-hour newscast Compass, visited in me in my office and recorded an interview. The piece aired that evening, and included an interview with a staffer in the PEI Attorney General's office who explained that Government's rationale for the change was a direct reaction to OpenCorporations and their feeling that the site was "reformatting" the information inappropriately. "The changes were made to take us back to the status quo," said Katharine Tummon, director of corporations for the office of the provincial attorney general. "When we were apprised of (Rukavina's site) we immediately were looking to ensure that our corporate registry maintains its integrity." She said the data was set up to be searched by company name only and was never intended to be used the way Rukavina's website does. She admits there's nothing in the current legislation to say that it shouldn't be used this way. This is because the Companies Act hasn't been updated since this kind of technology became available, Tummon said. "Other jurisdictions have modern provisions that are quite different from ours that place limits on the information." 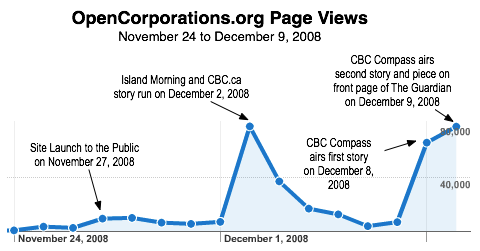 CBC Radio reporter Pat Martel followed up on December 9, 2008 with a story on Island Morning that later ran on the CBC.ca website as P.E.I. thwarts online effort to compile shareholder information. Later on December 9 reporter John Jeffery filed an updated story for Compass featuring an interview with Hon. Gerard Greenan, the province's Attorney General and the minister responsible for Corporate Register. The Minister essentially reiterated points made earlier by his staff: that the change left the public's ability to use the Corporate Register intact was his main argument. 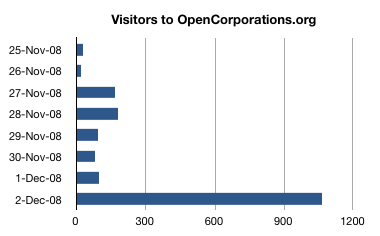 In the late afternoon of December 10, 2008 I redirected all traffic from OpenCorporations.org to a new site: ClosedCorporations.org contains the same data as OpenCorporations.org, but with clear indication that the data is out of date. I'll leave ClosedCorporations active for as long as it continue to be used, both as an archival resource — a snapshot of Prince Edward Island corporate ownership as it existed on November 19, 2008 — and as a memorial to a more open time in the life of corporate data.